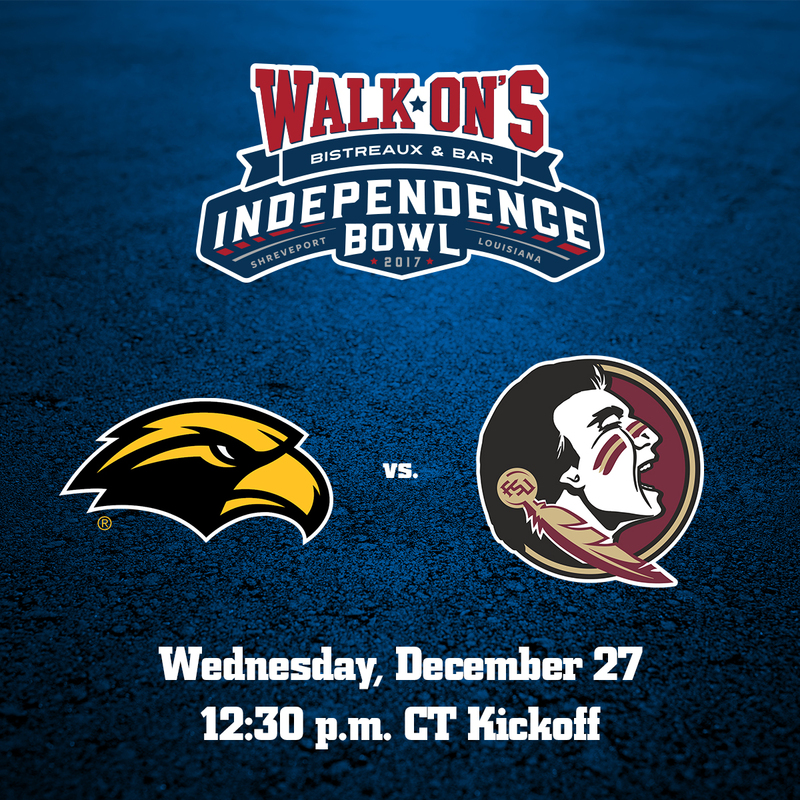 The 42nd playing of the Walk-On’s Independence Bowl will feature the Southern Miss Golden Eagles and the Florida State Seminoles. The Golden Eagles (8-4, 6-2 C-USA) are making their third appearance in the Walk-On’s Independence Bowl, and their first since 1988. They are 2-0, beating McNeese State 16-14 in 1980 and UTEP 38-18 in 1988. Southern Miss is led by coach Jay Hopson, who is in his second year with the Golden Eagles. It is the first representative from Conference USA to appear in the Independence Bowl, though three current members – Southern Miss, UTEP and Louisiana Tech – have participated in the past. The Seminoles (6-6, 3-5 ACC) are making their first appearance in the Walk-On’s Independence Bowl. They are 11th different representative of the ACC to appear in the Independence Bowl. The Seminoles won their final three games of the year to get bowl eligible. They are led by interim head coach Odell Haggins. Florida State and Southern Miss have played 22 previous times, with the Seminoles holding a 13-8-1 advantage. Florida State won the most recent matchup, 54-14, in 1996. Tickets to the Walk-On’s Independence Bowl can be purchased through Ticketmaster by going to www.WalkOnsIndependenceBowl.com, or by calling the Bowl office at (318) 221-0712 or toll free at (888) 414-BOWL. This year, fans with a ticket to the Walk-On’s Independence Bowl who are in attendance have an opportunity to win a new Ford F-150 through the Ticket to Drive promotion, courtesy of Gateway Tire & Service Centers and Toyo Tires.